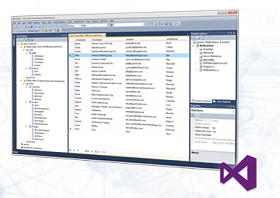 ADO .NET Data Providers is a powerful way to easily build applications that connect to Google, QuickBooks, Salesforce.com, and more in minutes using standard Visual Studio wizards. Easily build applications that connect to Google, QuickBooks, Salesforce.com, and more in minutes using standard Visual Studio wizards. Databind to Applications, Databases, and Services.